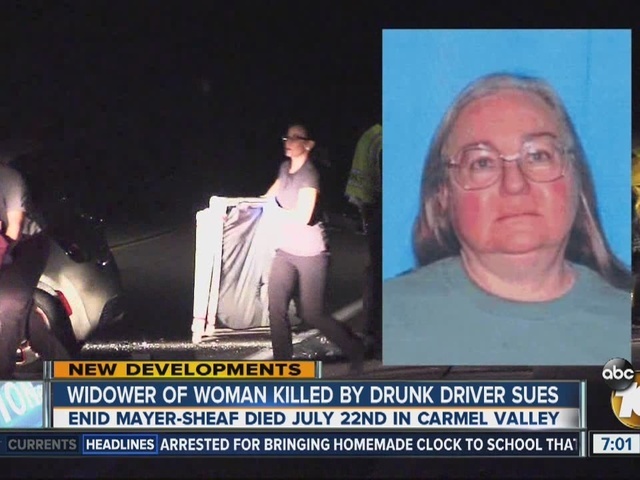 The family of a woman killed in a head-on traffic collision on Carmel Valley Road filed a wrongful death lawsuit against the alleged drunken driver accused of causing the crash. The lawsuit was filed Friday in San Diego Superior Court against 30-year-old Anthony Perez Rodriguez on behalf of Danny Sheaf, the husband of the victim -- Enid Diane Mayer-Sheaf -- and Christopher Sheaf, the victim's 22-year-old son. The crash occurred about 6:30 p.m. July 22 near state Route 56. A Fiat 500 driven by Rodriguez allegedly crossed the center divider and collided head-on into Mayer-Sheaf's 1987 Chevrolet Nova. Mayer-Sheaf, 61, died at the scene. Rodriguez, who was uninjured, was criminally charged with gross vehicular manslaughter while impaired and DUI causing great bodily injury. Frederick Schenk, the attorney for the Sheaf family, said the lawsuit alleges Rodriguez was severely impaired at the time of the accident and, therefore, directly responsible for the victim's death. Prosecutors in the criminal case said Rodriguez spent the day drinking at a Padres game, then at a bar. His blood-alcohol level was measured at between .15 and .16 percent -- about twice the legal limit -- some 90 minutes after the crash, according to prosecutors. "I'm not judging Mr. Rodriguez beyond what he did on this particular day. But, what he did on this particular day was tragic," said Schenk. Mayer-Sheaf was on her way home from visiting her dying mother-in-law. Her mother-in-law passed away the same day from a long-term illness. "You would expect maybe a spouse to be there to help you to take care of those needs on that occasion and yet he's having to bury his wife as well," said Schenk. The lawsuit seeks punitive and general damages, Schenk said. Mayer-Sheaf's family is devastated beyond words. "This is a very big loss to Danny. He and she were very close. They had a very loving relationship and Christopher loved his mother very much," said Schenk. Schenk said the family hopes the suit will deter others from getting behind the wheel drunk. "There's no money in the world that could ever make up for this horrible, tragic loss that day," said Schenk.